Help support this cause by making a donation today. You can now donate online! Save a tree and make your donation via Credit Card or PayPal by clicking below. Thank you for your continued support! Contribute to our Capital Campaign! If you are an Amazon shopper, please also consider doing your Amazon shopping through our unique link below. 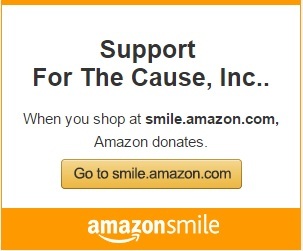 Your prices won’t change, but For The Cause will receive 0.5% of all purchases as part of the Amazon Smile program.